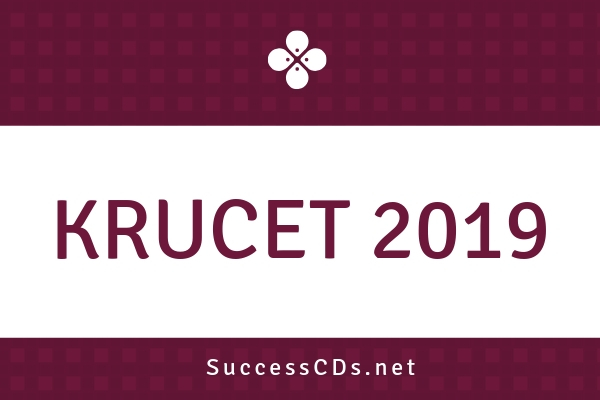 Interested candidates can check all the details of KRUCET 2019 Notification like application form, eligibility criteria, selection procedure etc from this page give below. M.Sc. Electronics and Instrumentation: A pass in B.Sc., with any one of the following subjects: Electronics / Computer Science/Instrumentation or Passed/Appeared in B.Tech. Electronics, B.Tech (Computer Science), B.E. (Electronics)/ B.E. (Computer Science),B.Tech (Instrumentation), etc. M.Sc. Applied Mathematics: B.Sc., or B.A. with Mathematics as one of the three equal subjects or as main subject. M.Sc. Mathematics: B.Sc., or B.A. with Mathematics as one of the three equal subjects or as main subject. M.Sc. Statistics: B.Sc. /BA with both Statistics and Mathematics. M.Sc. Computer Science: A pass in any Graduate program with computers as one of the subjects of study. M.A. History: BA with History or BA (O.L) or B.A.L. Hall tickets will not be sent to the candidates by post they have to download from the website www.krudoa.in or www.krishnauniversity.ac.in before the date of Entrance Test by making use of application number. Application duly filled-in together with all required enclosures should be submitted only to the "Director, Directorate of Admissions, Krishna University Dr MRAR PG Centre, Nuzvid-521201, Krishna Dist., AP (OR) "Director, Directorate of Admissions, Krishna University, Machilipatnam-521001" or by registered post or by speed post (in the cover provided) so as to reach on or before the prescribed dates mentioned already.